Aerosync Helicopter Support Division has gathered the most talented sheet metal technicians in the industry. Our roots extend back to the days of Helipro. 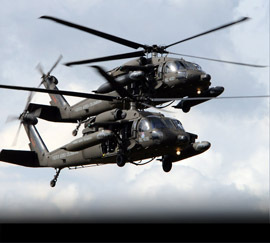 We employ the most seasoned individuals having expertise and experience with Bell Helicopter products and Sikorsky products with extensive know how on Blackhawk MRO / Depot Level programs. 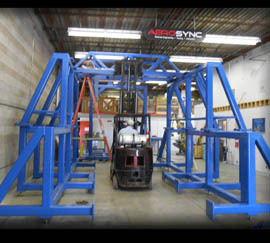 Aerosync is the leader in providing exceptional quality and delivery performance for structural repairs, modifications, and upgrade solutions. We offer services to both commercial and military markets. We provide on-site support for repairs and modifications globally 24/7. We are equipped to dispatch at a moments notice for AOG situations allowing our clients rapid repair solutions, minimizing costly down time. No matter your challenge, Contact the Professionals at Aerosync. Aerosync Tooling & Manufacturing Division designs and builts high quality tooling and holding fixtures for Rotary and Fixed Wing MRO/OEM Service Industries. Situated in Wichita, KS we have access to the most talented people, suppliers, and engineering / machining houses within aerospace industry. The services we offer also include precision Metrology Inspections for domestic and foreign clients. Whether the task is a simple part or component, or Hydro Turbine housing, we have the capablity to support your needs. Our capabilities can be applied to every type of industry, Aerospace, Marine, Railway, these are among the few segments we service and we do this for both Commercial and Military applications.